Yes, this looks like a glass of milk with some dirt sprinkled on the top. But it's not, I promise. I had never even heard of horchata until a couple weeks ago when I went with my parents to Cafe Rio and saw that it was one of the drink options at the restaurant. It looked interesting and I was in an adventurous mood. Holy crap it was good! It's like rice pudding: the drink. So if you don't like rice pudding, this is probably not for you. Plus, it takes some planning since you get the best flavor if you let it sit overnight. 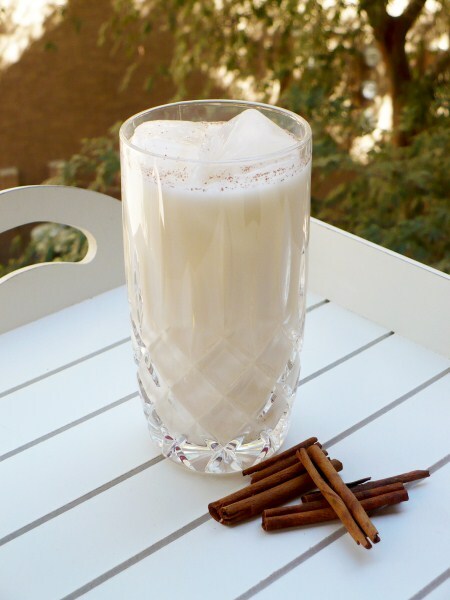 This version of horchata is essentially water infused with rice and then mixed with milk, vanilla, and cinnamon. It's made with different ingredients in different countries, but I'm perfectly happy with this variation. And I like mine a little more "creamy" so I add more milk than some of the recipes I've found online. If you can't have milk, just Google "horchata recipe" and you'll find plenty of options including some using almonds or cashews instead of milk. It's best served cold, over ice, and is very refreshing in the summer heat. I've given ranges of measurement for the sugar and vanilla - start with the lowest, taste, and adjust accordingly. Some people like it really sweet. Me, not so much. Rinse rice in a strainer and add to a blender with 2 cups of the water and cinnamon sticks; pulse for 1 minute or until rice and sticks are broken up into little bits. Pour mixture into a pitcher with remaining 3 cups water and let sit overnight (room temp or refrigerated is fine). Strain the mixture and stir in milk, vanilla, and sugar to taste. Chill until serving, then sprinkle with ground cinnamon, if desired. Keeps up to 4 days in the refrigerator (if it lasts that long).